I have a lil' prop bet contest going on this month. Nothing major, but a nice bit of motivation for grinding. It's a three way dance between myself, and Blonde forum members Longy and Moon&Back. $250 in the pot each, and winner takes all on who can make the most profit playing SNGs of less than $30 in stake on PokerStars in November. They both have pretty Sharkscope graphs, and good multi-tabling skills as well, so I think it's going to be a tight contest. Hopefully my ability to put in a lot of volume will help me through, although a server restart on PokerStars just as I was about to start my session today is a bit of an annoyance! I've started well, racking up $900 or so in 450 games...but a real nasty downswing as I finished my last session, with zero cashes in my last 34 games, which is set to be my worst non-cashing streak in the 8,000 games I have now played on Stars. We're keeping track of our progress so far in this thread on Blonde. of the events as possible. With potentially large fields of satellite qualifiers, I imagine them being a fair bit of value. Note that I have added a 'blogroll' of the podcasts that I listen to on the left hand side of this blog. These are great for making the grind of online play more bearable by having them on in the background, and I think they are all of great quality and worth listening to (and as I have mentioned previously, the 2+2 Pokercast is especially excellent). Also it's only 4 days until the final table of the WSOP main event is played out on November 7th. Of course I will be routing for fellow Brit James Akenhead, and I also hope that Phil Ivey does well as I think it could potentially be good for the game if he does. I have a little vested interest in Joe Cada in the form of a sweepstake, so plenty to keep me interested in what goes down. 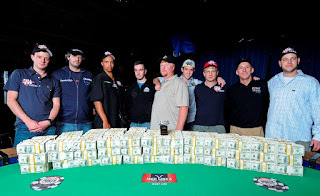 I have been enjoying the footage of the 2009 WSOP which I downloaded from this handy lil' site so far, and although there's no way around finding out the results before you see the actual footage these days, it should make for compelling viewing. 0 Comment to "Mini-prop bet for November..."